WALLIS SIMPSON DUCHESS OF WINDSOR Photograph Signed. Wallis Simpson (born Bessie Wallis Warfield), later Duchess of Windsor. Spouse of the former King EDWARD VIII who had abdicated from the throne in order to marry her in 1937. Known to the British press and public as the infamous "Mrs. Simpson". 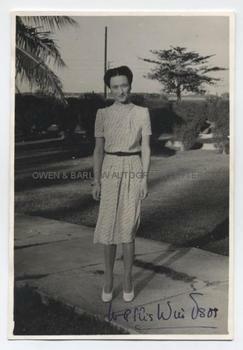 Photograph, signed as Wallis Windsor. The photograph is an informal portrait of the Duchess, full-length, wearing a belted summer frock of floral print. She stands on a pathway with lawned gardens in the background. It was taken in the Bahamas during World War II, during the Duke's Governorship of the Islands. Boldly signed with a good signature across a light portion at foot. 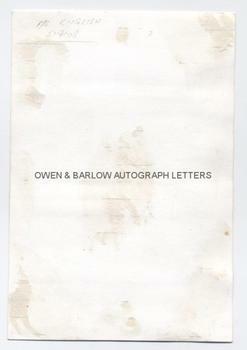 Approx 7 x 5 inches. Mounting traces to verso, else fine. Following the abdication crisis and their marriage in 1937, the Duke and Wallis Simpson, now known as the Duchess of Windsor, were effectively exiled and took up residence in France. During the War, as German troops moved westwards, the couple moved to Spain and then to Portugal, before finally transferring to the Bahamas, where Edward was installed as Governor. She carried out her duties there, as Governor's wife, for five years, although she disliked it. She called the Bahamas "our St. Helena" - a reference to Napoleon's final place of exile. Both were believed to have Fascist sympathies and Wallis was suspected of passing information to the Germans throughout the war. Following Edward's death in 1972, the Duchess lived in Paris as a semi-recluse, increasingly frail and suffering from dementia. She was never permitted to use the Royal title H.R.H. during her life. When she died, however, her funeral was held at Windsor Castle, attended by the Royal Family and she was buried next to Edward at the Royal burial ground at Frogmore.